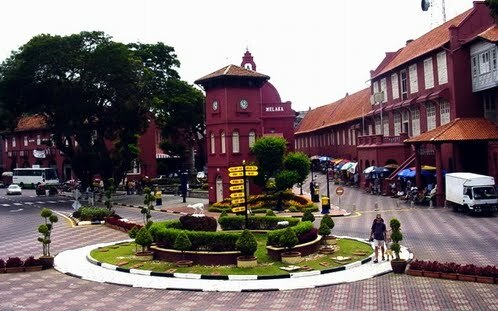 When Melaka fell into the hand of the Portuguese in 1511, it became the first city in South East Asia to have a cross, erected on top of the Melaka Hill. Christianization of the city took place afterwards, with European forts and churches being built as old Malay graveyards, palaces and forts were ransacked and destroyed. The destruction was extensive and systematic. For example, none of the graves of the Sultans of such a great Sultanate survived. Missionaries such as St Xavier and Father Pidanto came to Melaka. The extent of the Christianization of Melaka during Portuguese time could be gleaned from what the latter wrote: "Melaka is a Christian city, with each street and hill lined with churches." The presence of Christianity in Melaka remains strong today, although it is limited to ethnic Chinese and Indian and a small Serani (Portuguese- descendants) community. We do not know exactly how the Malay Muslims who had remained within the limit of the city of Melaka lived under the Portuguese through out the turbulent times. If what Father Pidanto wrote was true, and given the role of St Xavier in the instigation of the Inquisition in Goa, we should expect that at least some of the Malays converted to Christianity but remained Muslims in private life and then reconverted to Islam openly when the opportunity arises. The authority of the Portuguese was limited to the city. The surrounding villages were loosely controlled through harassment, and punitive raids and forced to pay taxes, but otherwise they freely retained their Islamic creed. 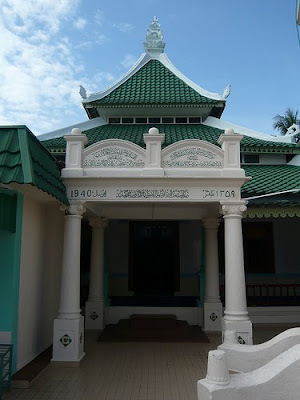 A few areas such as Serkam, Pulau Besar and Paya Rumput in Merlimau, as evidenced from the numbers of scholars who hailed from these places, even became known centres of Islamic studies. Today, if one drives along the Melaka-Muar old road through the district of Merlimau, one can find a handful of buildings with names like Madrasah Abdul Latif and Madrasah Abdul Ghani, indicating the place past history as Islamic learning centers. More numerous however, is the number of gorgeous looking, Melaka-style traditional mosques, some painted beautifully in striking colours. None of the mosque dated from the Portuguese time, being mostly about 100-200 years of age, but they retain the multi-tiered Meru-roof which is supposedly taking the precedence from the now-gone Big Mosque of the Melaka Sultanate. Almost all mosques along the drive was built in stone and come with a tall minaret. The minaret is believed to be a later additional feature of Malay traditional mosque, introduced in the 19th century. In Merlimau for example, history recorded that many of the mosques were built by Chinese stonemasons, including one Chinese Muslim Master. A mosque of note in the area is the Serkam Pantai Mosque. The Serkam village is actually divided into two – Serkam Pantai (on the seaward side) and Serkam Darat (on the landward side). Just before the time of building, many religious teachers were residing in Serkam Pantai, managing a few madaris. Hence, when the village decided to build a new mosque, they chose a site in Serkam Pantai, which was donated by a local headman. 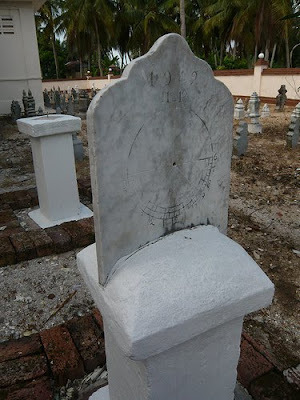 The grave of the man, Dato Lahad, now lies inside the small cemetery attached to the mosque. The mosque was built using woods from nearby forest dragged by buffaloes. The walls, the roof’s crown and the ‘sulur bayur’ were made using coral stone, a mtechnique/material which maybe peculiar to this area. Coral stone was also used to build the 70 metres tall muazzin tower. When it was completed, the tower immediately attracted huge number of visitors. It once collapsed under their weight and had to be rebuild again. 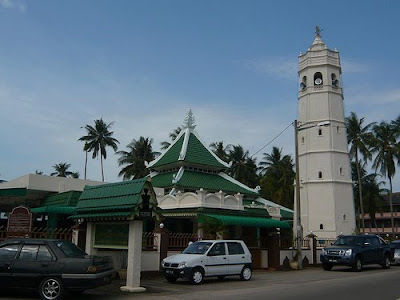 What sets Serkam Pantai Mosque special in comparison to other mosques in the area is the existence of two sets of sun clocks in its compound. Although it is not very clear on who first made these clocks, evidences are pointing to a local figure known as Haji Omar bin Osman, who once organised the takwim for Melaka in 1980s, and was a student of Haji Abdul Latif Thambi al-Malakawi, a falak master. Haji Omar also received instructions on how to create takwim and sun clock from Syeikh Tahir Jalaluddin, another falak master from Perak, as could be read in several letters in the Collection of Syeikh Tahir’s Letter. The existence of these sun clocks, numerous mosques and religious schools in Merlimau points to a yet another hidden local history of Melaka. We are always offered a very Westernised history of Melaka – one that from 1511 onwards, portrays a Melaka that is devoid and cut off from the surrounding Malay-Muslim culture. There is a greater (or over) emphasis on the Portuguese, Dutch and Chinese elements and history in Melaka than the Malay-Muslims’, especially now that Melaka has been declared a UNESCO World Heritage site. Of the city proper’s many attractions, only a few are of the Malay-Muslim heritage (e.g. Masjid Kg. Hulu). Less information is given about Malay-Muslims historic sites around and out of the city, and lesser still of the city’s Muslim inhabitants contribution to its development, education and culture. The sun clocks remind us that the activity, concern, integrity and level of knowledge of the scholars from Melaka remains high, dynamic and did not cease with the fall of the sultanate. Melaka - a UNESCO’s World Heritage site - is well depicted in this beautiful book entitled ‘Melaka from the Top, by Dennis De Witt and published by Nutmeg Publishing. It contains many unique pictures of the historic town of Melaka in Malaysia. This book traces back and compare the transformation and development of the town of Melaka and its surroundings over the centuries. It is a collector's item for anybody who has ever visited Melaka and it allows readers to see Melaka like never before - from the Top.